This chapter reviews the basic principles of diffusion magnetic resonance (MR) imaging in a comprehensive manner, including both diffusion-weighted imaging (DWI) and diffusion tensor imaging (DTI). We introduce the effect of water diffusion on MR signal and methods used to measure the diffusion coefficient using MRI. The diffusion tensor and tensor-derived indices are presented in an effort to characterize the anisotropic nature of in vivo diffusion. Tractography using DTI is also discussed. 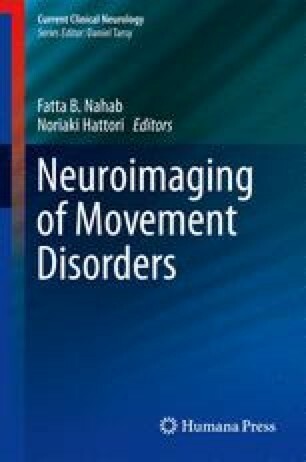 The second part of this chapter describes the recent findings in various neurological movement disorders using diffusion imaging, including idiopathic Parkinson disease (iPD), progressive supranuclear palsy (PSP), and multiple system atrophy (MSA). The discussion includes studies based on regions located in the basal ganglia where changes of water diffusion coefficient have been reported, and impairment of white matter integrity where DTI has been most successful. The limitations of various diffusion imaging methods are discussed. The third part of this chapter presents an overview of diffusion kurtosis imaging (DKI), an advanced technique for measurement of restricted and hindered water diffusion in biological environments that significantly improves sensitivity and specificity when compared with conventional DTI.